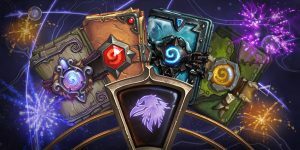 Hearthstone is celebrating their Year of the Raven by giving players the opportunity to earn free card packs. The Year of the Mammoth, which began on March 29, 2017, is coming to an end. The Year of the Raven will begin in mid-April when The Witchwood expansion arrives. To celebrate the upcoming Year of the Raven, we’re throwing a New Year of the Raven party! Every time you complete a daily quest, you’ll also be awarded a card pack! These packs can be from Journey to Un’Goro, Knights of the Frozen Throne, Kobolds & Catacombs, or even The Witchwood! You can tear open The Witchwood card packs once the expansion goes live in April! This event begins on March 26, at 11:59 pm PDT, and will last until April 9, 11:59 pm PDT. Players need to be aware that the rewards take effect after Midnight. The Hearthstone blog post asks players to please wait to complete their daily quests until after the clock strikes 12! In addition, Hearthstone is offering players a way to obtain Lunara. She is a Druid Hero that can replace the Hero on the Druid deck that players started with. To get it, players have to win 10 games of Hearthstone in Standard Ranked or Casual mode after The Witchwood expansion has launched. Two weeks after The Witchwood expansion is released, a single-player Monster Hunt event will begin. It is similar to the Dungeon Run from the Kobolds & Catacombs expansion. Players will defeat bosses and collect their bounties to build a deck that will keep them alive as they continue through the Monster Hunt.